Reload Internet is the best studio in London to get your Tajikistan passport photo or visa photo from! 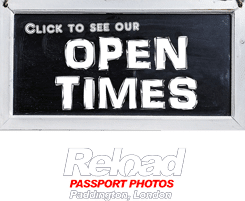 We are a professional passport, ID and visa photo studio located in Paddington, London, that has been in operation for well over a decade, producing hundreds of government document photographs every single week. We can capture, print and cut your Tajikistan passport photo or visa photo instantly in our store; we aim to have all of our customers photographs ready within 10 minutes of their arrival. We stay open throughout the week at Reload Internet, from early morning until late evening, so you can come and visit us at a time that suits you. Our store is also located on the same street as Paddington tube and train stations, making us easily accessible for people from every area of London. There is no need for an appointment, just stop by our store and a member of our team will be happy to assist you! Get your Tajikistan passport photo or visa photo from Reload Internet, and we will supply you with 6 high quality photographs that are 100% guaranteed to pass when you submit them with your application the the Tajikistan Embassy. We will capture your photograph with the correct background and lighting required, and will then cross-check your image to ensure that it meets all of the necessary requirements. After checking that you are satisfied with the photograph, we will print out a set for you using embassy-approved digital photo printers and cut them to the required size so that they are ready to be submitted with your application. All of our photographs come with a 100% guarantee to be accepted when submitted along with your application to your chosen Embassy. This is why our service is unbeatable, making us the most convenient, reliable and successful passport, visa and ID photo studio in London! Your Tajikistan passport photo or visa photo must meet every single one of the requirements listed below, otherwise it will be rejected when you submit it with your application to the Tajikistan Embassy due to a photo error. The required photograph size for your application is 4.5cm x 3.5cm. 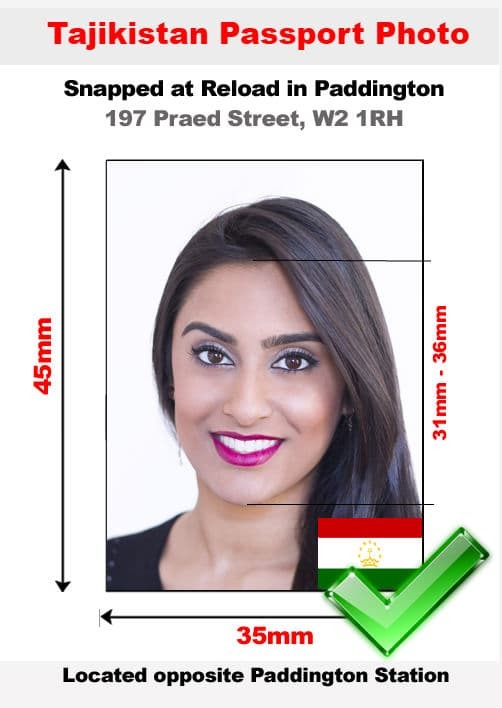 The applicant’s face must cover 70-80% of the photograph, this means that when printed the length from the bottom of the chin to the top of the forehead must be between 31-36mm. Photographs must be 6 months old or more recent. Photographs found to be older than 6 months will cause your application to fail. It is important that you adopt a neutral expression, mouth closed and both eyes open wide looking directly into the camera lens. When the photograph is taken, your head should be square and straight to the camera with the camera lens at eye level. If you wear glasses, we strongly recommend removing them for the photograph. Glasses frames covering the applicant’s eyes, as well as reflections from the lenses will cause your photograph to be rejected. Headgear is not allowed, except for medical, religious and cultural circumstances. In these cases, the applicant’s head must still be visible from the bottom of the chin to the top of the forehead. If your Tajikistan passport photo or visa photo does not meet all of the requirements above, your application will be rejected when you attempt to submit it to the Embassy. By visiting Reload Internet, you remove any possibility of your application being rejected due to a photo error, as all of our photographs come with a guarantee to be accepted when submitted to your chosen Embassy. Our specifications viewable above are taken directly from the Embassy of Tajikistan official guidelines on visa and passport photographs which can be found through their website here.